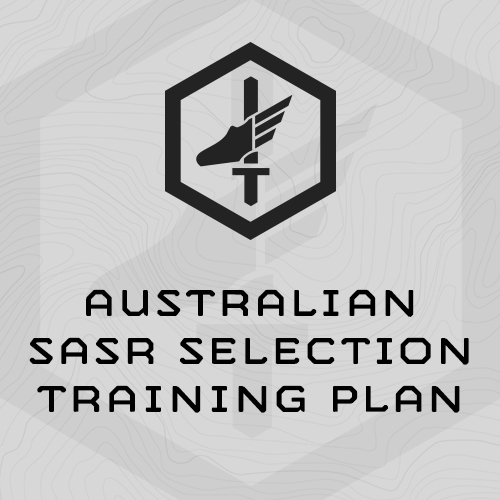 This program is intended to be done the 10 weeks prior to starting Australian SASR (Special Air Service Regiment) Selection. You will take fitness assessments during Weeks 1, 5, and 9. You will train 6 times a week during Weeks 2, 3, 4, 6, 7, and 8 and 5 days a week during 1, 5, and 9. You will use the results from the assessments in subsequent training sessions. These assessments scale the training program to your ability. Always record your reps/times and always use the results from the most recent assessments. In Weeks 1 through 4, you’ll use the results from Week 1’s assessments. In Weeks 6 through 10, you’ll use the results from Week 5’s assessments. Weeks 9 and 10 are taper weeks designed to keep you fit and allow you to recover before you begin selection. The Friday of Weeks 2, 3, 4, 6, 7, and 8 contain physically and mentally demanding long distance rucks up to 28 km, and is followed by another, marginally shorter ruck on Saturday. You must prepare your equipment and nutrition ahead of time to complete these sessions. This is a very intense training program. It includes assessments designed to be performed at your physical limit, high intensity runs, long distance rucks, and multiple 2-a-day training days. Overall, this program has a sharp focus on improving your ruck performance and endurance, muscular endurance, and work capacity, while also dedicating time to improve your durability in order prevent injury during the long 21 day selection course. 36 kg (80#) Sandbag - can use a sealed canvas or sturdy duffle bag, or one of ours. (1) Max reps Heaves - maintain a straight body throughout, no swinging or crossing legs. One rep = straight elbows at bottom to chin above the bar. Can use overhand, underhand, or alternated grip. (2) Max reps Push-ups in 2 minutes. (3) Max reps Sit-ups. Perform 1x sit-up to a 3 sec. cadence. (1) Perform as many Sandbag Get-ups (SBGUs) as possible in 10 minutes with a 36 kg Sandbag. RECORD ALL REPS AND TIMES. Max reps Heaves in 60 sec. Run 800m @ interval pace using the MTI Running Calculator and your SESSION 1 3.2 KM web run time. Note: 3.2km = 2 miles. Use the MTI Running Calculator to find your interval pace - Use the "2-mile" assessment and your most recent SFET 3.2km Web Run to find the appropriate interval pace.